Sometimes a break seems to be stable and is put in a cast, but as the swelling goes down the broken bones move apart and need surgery to put them back in place. For this reason, you will have regular X-rays while your arm is in a cast, to make sure the bones stay in the right place while they are healing. There are several things you can do yourself to help your forearm heal, whether or not you are having surgery. Don't do any heavy lifting or gripping with the affected hand, as this will increase your pain and slow your recovery. You will probably need some time off work to let your forearm recover. Take regular pain relief. The best pain relief is paracetamol (Panadol) or paracetamol and codeine (Panadeine). Take two tablets every four hours, but take no more than eight tablets a day. Avoid anti-inflammatories such as ibuprofen as they may slow down how quickly your bones heal. The more swollen your forearm is, the more painful it will be. To reduce swelling, keep it raised (elevated) above the level of your heart whenever possible. Also apply ice (wrapped in a towel or plastic bag) to your hand or arm above the cast. Don't put ice directly on your skin, as this can burn it. Your hand and arm will be put into a cast to hold the bones in place and stop them from moving. The cast will probably start near your knuckles and go halfway up your upper arm with your arm bent at 90 degrees. This helps to keep your forearm bones in the right place while they are healing. You will wear the cast for six weeks, but can probably start doing some gentle hand exercises after three weeks. You will still have to take special care of your forearm once the cast comes off. The same exercises that help with a broken hand or wrist will help with your broken forearm. If you need surgery for your broken forearm it will be done by an orthopaedic (bone) surgeon. Your surgery will involve some metal (usually a plate and screws, and occasionally wires) to line up your bones properly and support them while they heal. Sometimes a forearm bone is so badly crushed that it leaves a gap when it is put back into place. If this happens to you, you may also need a bone graft, which will usually be done during your surgery. If you need a graft, the bone will most likely be taken from your radius (forearm), or occasionally it may be taken from your hip. If it's taken from your radius, it will be on the same side as your injury, but it will be a very small amount and the bone will heal while your arm is in the cast. You will need at least two weeks off work after surgery. Exactly how much time you will need depends on which bone was broken, whether the break was in the arm you use most (your dominant hand), what your job involves, and whether there are any light duties you can do. For example, if you are an office worker you may need just 10 to 14 days off work. But if you are a manual worker you may need 10 or more weeks. As you recover you'll have regular appointments with your surgeon, and some X-rays to make sure your forearm is healing well. You may also need some physiotherapy to strengthen your hand and get it moving again. Wires usually need to be removed once you have healed. Exactly when that will happen depends on how bad your break was, and how quickly your bones heal. 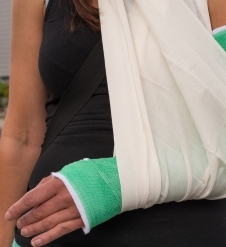 For two to three months after surgery you will not be able to lift or carry anything with the injured arm. You should also avoid sport or any other activity that may make your injury worse. Your surgeon will let you know when it's safe to start doing these things again. If you have wires that are poking out from the end of your forearm it's important to protect them from becoming caught on clothing, or anything else. You could pull the wires out this way, which would be painful – and you might need repeat surgery to put them back in. This can sometimes mean you don't heal as well as possible and your arm will never work as well as it could.